Black Dog is a family business run by Daniel Collings. It was started by Daniel's parents Philippa Threlfall and Kennedy Collings during the early 1980's in Wells, Somerset. The Black Dog design studio and workshop relocated to Bath in June 2016. Click on Our Shop to find us. 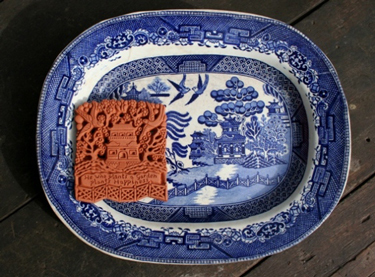 Philippa trained at Cardiff College of Art as an illustrator and potter. This unusual mixture of disciplines led to an excitement with surface and texture and she soon began working in modelled and textured clay. Her first major commission was a painted tile mural in 1962 which then led to further commissions using ceramic and stone. In 1967 she met and married Kennedy. He was a Cambridge historian who, after working in industry, had developed an interest in reproducing limited editions of sculpture. Philippa and Kennedy went into partnership in 1968. Together they designed and made many large murals and pieces of sculpture in ceramic, mostly for public situations and often with historical themes many of which can still be seen today. 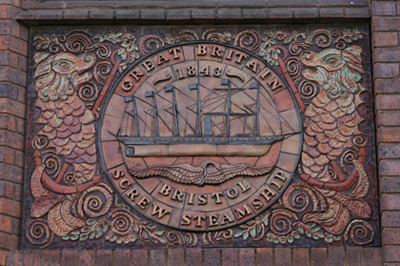 Shown here is one of the 15 panels situated on Broad Quay House in Bristol. Philippa's website www.philippathrelfall.com shows all her major works for both public and private commissions. The name 'Black Dog' comes from the title of Philippa and Kennedy's original property in Tor Street in the city of Wells. Records for the house go back to 1562. In 1636 reference is made to the property commonly known as 'Ye Blacke Dogge'. It was a cider house, of which there were many in Somerset at that time. In the early eighties and under the name Black Dog of Wells, Philippa and Kennedy developed a range of unusual decorative tiles. They evolved a unique process to reproduce these in natural terracotta, basing the designs on historical and traditional sources and often incorporating texts to add significance. There are well over 100 designs in our range, with new ideas being added all the time. The tiles have sold in many thousands, and we know are collected by people all over the world. 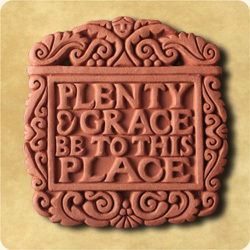 Shown here is 'Plenty & Grace'. This is one of our most popular and longest running of our designs. Daniel who had been working in the cartographic industry for eight years joined Black Dog in 2002, the same year that Kennedy died. He was able to bring new strengths and ideas to the business. Black Dog celebrated thirty five years of making decorative tiles in 2016. Although Daniel now designs the tiles, Philippa provides a valuable consultative role. Daniel and Philippa take ideas from all sorts of references collected over the years - carvings in wood and stone, manuscripts, tapestries and engravings. Here are examples of how three designs came into being. A short time lapse film to show the evolution of the Happy Hen design. We selected a few images of Staffordshire hens sitting on baskets and created a hybrid of these images for a version that would work well as a tile. You may notice that there are several attempts to get the patterning on the wings to work. 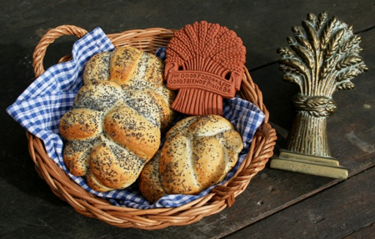 The corn sheaf tile is based on a Victorian brass doorstop. The text 'For good food and good friends Praise be' was first heard as a grace said before a meal and we incorporated this into the design. The tile is shown here being used as a breadwarmer. When heated in the oven the pottery, retains its heat and keeps the bread warm for longer. 'He who plants a Garden plants Happiness' is translated from a Chinese proverb. We wanted to incorporate this saying into a design with a Chinese flavour, and so used a 19th century 'willow pattern' serving dish as the source of the image. Translated into modelled clay, the original painted image takes on something of the quality of a piece of carved ivory.